Coconut’s Fish Cafe opened in 2009 in Maui, Hawaii. Our small restaurant quickly became a favorite with kama’aina (locals) and tourists alike, with our family-friendly atmosphere, custom surfboard tables, exceptional food, healthy food choices, and aloha culture. 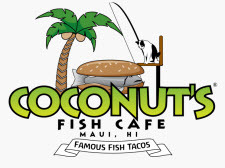 In 2013, Coconut’s Fish Cafe opened in Scottsdale and has experienced the same success as our Maui location, success driven by the loyal patronage of the Coconut’s ohana. Recently Coconut’s Fish Cafe expanded to Texas and has been serving the same great food to the people of Dallas and Plano. The family-run businesses in Texas are another example of Coconut’s mission to serve excellent, healthy food while sharing the aloha spirit. Today, we are proud that every Coconut’s location has organically received 4.5+ star ratings on Yelp and on TripAdvisor. I can see why this place has gotten so many good reviews. As soon as you walk in, the place feels bright, airy, and super friendly. The menu is not extensive just enough variety and everything looked good and healthy, including the kid's menu. The menu has great value - one order of tacos feeds two!!!! However, I have been known to devour my own order!!! The cleanliness & Hawaiian charm of the decor make it fun eatery. Check out the surfboard shaped tables!! The fish taco mountain I ordered was a delight -- perfectly grilled chunks of fish over brown rice, with a tangy mango salsa and a flavorful dressing with what seems to be a zestful hint of wasabi. The staff will proudly inform you that there are 17 ingredients in a taco, but by itself that doesn't prove anything. What's important here is that there are not one or two, but three distinct components that shine through, each one a superstar. #1 - the fish, which is a mixture of grilled ono and mahi-mahi. #2 - the cole slaw, chunks of cabbage with coconut milk (no mayo). #3 - fresh mango pieces. The other 14 ingredients no doubt are also contributers to the overall flavor. You pick up the taco with your hands so that you get a mixture of ingredients in each bite, dripping juice and dribbling tomato pieces onto your plate, grinning from ear to ear, and not talking to anyone while the flavor lasts.